Best practices, type of work and author indicators are shown on The Globe and Mail, The Independent Journal Review in the U.S. and la Repubblica of Italy. In an era of digital misinformation, social interference and allegations of “fake news” in everything from press conferences to political panels, it’s no surprise readers have become increasingly skeptical about discerning fact from fiction in the news they consume. Canada is not immune to a decline of trust in media. A 2018 study published by Vividata found 28 per cent of Canadians felt their trust in news eroding as a result of misinformation. Although trust in traditional news outlets and digital content published by newspaper brands ranked higher than digital-only properties, the subversion of credibility is a very real threat. As an ongoing response, The Globe and Mail continues its leadership in The Trust Project, an international consortium of major publishers and platforms building a system of higher standards for truth and transparency in journalism. Led by award-winning journalist Sally Lehrman and hosted by The Markkula Center for Applied Ethics at Santa Clara University, the consortium has created a digital protocol of “indicators” now being shown to the public by 120 websites, including those of The Washington Post and The Economist. The trust system stems from research conducted in reader interviews, followed by workshops among news professionals in the U.S. and Europe, over the past two years. What do readers look for in a trusted news website? What information about a reporter or publisher will strengthen reader trust? Trust indicators are multifaceted, encompassing policies and information, user features, improved signals and labelling of content, and digital code standards. Indicators are user facing (what the reader sees) and machine readable (what the network sees), incorporating a common tagging language that will allow digital platforms like Google, Facebook and Bing to verify content in news feeds and search databases. This creates a dual verification system for readers, so you can check the trust indicators that matter to you now, and have confidence accessing trusted information from search engines in the future. Company information and best practices: Ownership and founding date, the editorial mission, the editorial code of conduct, and contact information for senior editors is clear and accessible in the About Us section. 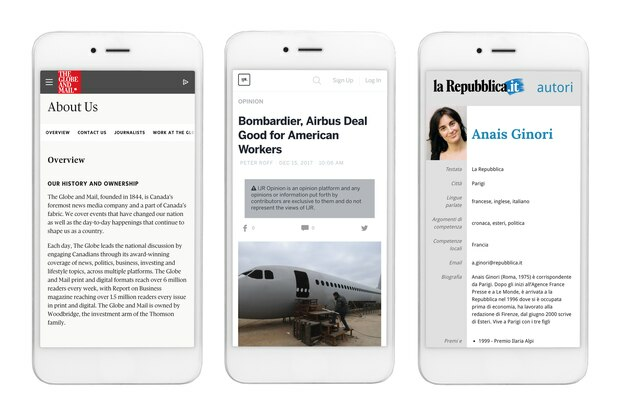 Story information: Description labels on articles and section pages distinguish opinion, explainer, analysis and advertiser content from news, allowing the reader to comprehend the type of story quickly and effortlessly. Author information: These indicators highlight information about writers, their contact information, biographical details and areas of expertise, and show an archive of their past stories. Click on a staff reporter or columnist’s byline to be directed to their author profile page. As of today, 34 partners have joined The Trust Project, including four new Canadian members: The Canadian Press, The Walrus, the Toronto Star and the CBC. As a trusted news source for Canadians, The Globe and Mail continues to support efforts maintaining a high standard of transparency and integrity across the digital landscape. For more information about The Trust Project, visit thetrustproject.org. Devin Slater is The Globe and Mail’s design director and a contributing member of The Trust Project’s UX and development working groups.